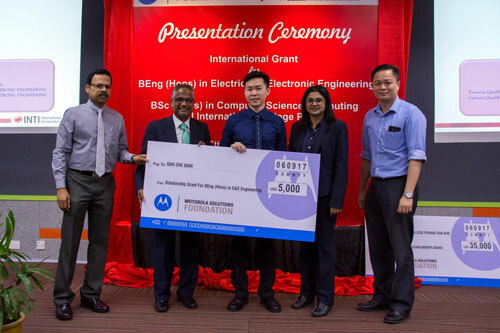 Motorola Solutions Foundation, the charitable arm of Motorola Solutions, has for the fifth year in a row selected INTI International College Penang (INTI) as one of the recipients of its global grant. Valued at USD 35,000, the grant seeks to benefit communities and institutions, and was awarded to INTI for its efforts in advancing science, technology, engineering and mathematics (STEM) education within the Penang State. Goh Zhe Qian, Bachelor of Engineering (Hons) in Electrical and Electronic Engineering, received the scholarship for the second year in a row. Recipients of the student scholarships this year included Goh Zhe Qian, Koh Yuen Khang, and Lim Pei Yine, from the Bachelor of Engineering (Hons) in Electrical and Electronic Engineering; and Koh Kar Keat from the Bachelor of Science (Hons) in Computer Science. Pei Yine was also the first female student to receive the grant, an important milestone in encouraging the interest of young women in STEM. Dr Hari Narayanan, Managing Director of Penang Operations for Motorola Solutions Malaysia, sixth from right together with INTI representatives at the award ceremony. “Today’s students are preparing for jobs that are either in infancy or haven’t even been invented. As a global leader in innovation, Motorola Solutions recognises the importance of industry-institution collaborations which empower students to realise their potential in STEM-related careers. 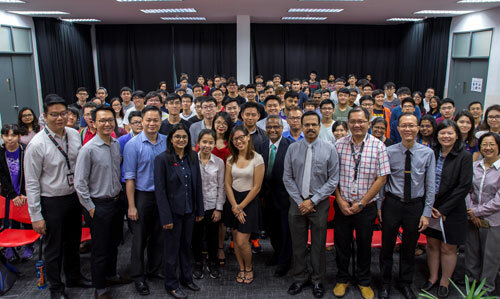 The grant and our ongoing partnership enable students to develop their technical expertise while still studying, preparing them for the challenges and opportunities of tomorrow’s workplace,” shared Managing Director of Penang Operations for Motorola Solutions Malaysia, Dr Hari Narayanan, who visited INTI to award the grant. INTI’s partnership with more than 450 industry partners, including those from the engineering and technology industries in Penang, has led to outstanding graduate outcomes which were validated by BDO Governance Advisory, including 98% of students being employed within six months of graduating; 82% being paid higher than the market average; and 25% receiving job offers even before they graduate. Through programmes such as the annual Moto Inno Cup competition, an annual inter-varsity software competition, INTI and her partners continue to support and grow STEM opportunities for her students and the community.